*Division of Gastroenterology, Asan Medical Center, University of Ulsan College of Medicine, Seoul, Korea. †Division of Oncology, Asan Medical Center, University of Ulsan College of Medicine, Seoul, Korea. We aimed to evaluate survival time and prognostic factors in patients with advanced unresectable cholangiocarcinoma who have not received surgery, chemotherapy, or radiotherapy. A total of 1,377 patients, who were diagnosed with primary cholangiocarcinoma between 1996 and 2002, were reviewed retrospectively according to the following inclusion criteria: histologically proven primary adenocarcinoma arising from the bile-duct epithelium, advanced unresectable stages, no severe comorbidity that can affect survival time, and no history of surgery, chemotherapy, or radiotherapy. Of the 1,377 cases reviewed, 330 patients complied with the inclusion criteria and were thus eligible to participate in this study; 203 had intrahepatic cholangiocarcinoma and 127 had hilar cholangiocarcinoma. The overall survival time of the entire cohort (n=330) was median 3.9 months (range; 0.2 to 67.1). The survival time was significantly shorter in the intrahepatic cholangiocarcinoma group (3.0±5.3 months) than in the hilar cholangiocarcinoma group (5.9±10.1 months; Kaplan-Meier survival analysis). Multivariate analysis revealed that distant metastasis was a poor prognostic factor for intrahepatic cholangiocarcinoma (p< 0.001), baseline serum albumin >3.0 g/dL was a favorable prognostic factor (p=0.02), and baseline serum carcinoembryonic antigen level >30 ng/mL was a poor prognostic factor for hilar cholangiocarcinoma (p=0.01). The median survival of advanced unresectable cholangiocarcinoma is dismal. While surgical resection remains the only curative treatment, most patients are far advanced at presentation which leads to high mortality rates. Radiotherapy and systemic chemotherapy have been evaluated in unresectable cholangiocarcinoma, but have failed to show satisfactory results.6-13 Recently photodynamic therapy has been evaluated in hopes to confront this intractable disease.14 Due to the restricted number of patients included in the trial, however, benefits have been debatable and there have been limitations in generalizing the results. The aim of this study was to evaluate the "natural history", which is the outcome from the time of diagnosis to death without therapeutic intervention, of cholangiocarcinoma. To our knowledge, this is the first large-scale study that investigated the survival data of patients with advanced cholangiocarcinoma who did not receive therapeutic interventions including surgery, chemotherapy or radiotherapy. Knowing the natural history, specifically the survival, of cholangiocarcinoma is important for rational treatment recommendations. We hope our results regarding survival will be used as a reference standard in the outcome assessment of therapeutic maneuvers for this challenging disease. Between 1996 and 2002, a total of 1,377 patients coded by the disease code of International Classification of Disease (ICD-10) with primary cholangiocarcinoma were managed at our institute, a 2,700-bed tertiary referral university hospital with a dedicated center for cholangiocarcinoma. After obtaining approval from the institutional review board to review the patient records for the outlined study, we reviewed medical charts to identify patients for retrospective analysis according to the following inclusion criteria; histologically proven primary adenocarcinoma arising from bile duct epithelium, advanced unresectable stages, no comorbidity that can affect survival (e.g., severe cardiac, pulmonary or renal disease), and no history of surgery, chemotherapy or radiotherapy. The time and cause of death of those patients were identified from medical records of our institute or data of mortality offered by National Statistical Office. We excluded gallbladder cancer, metastatic cancer and cases diagnosed on radiographic appearance without pathologic proof in order to rule out any malignant appearing benign biliary strictures. Unresectability was determined with preoperative evaluation or open biopsy and the following clinical conditions were considered to be unresectable;6,15-18 involvement of bilateral secondary radical hepatic ducts, invasion of main portal vein or proper hepatic artery, atrophy of one hepatic lobe with contralateral vascular invasion, atrophy of one hepatic lobe with contralateral tumor extension to secondary biliary confluence, invasion of secondary biliary confluence on one lobe and contralateral vascular invasion, or distant metastasis. We excluded patients who received chemotherapy, radiotherapy, or any surgical intervention (palliative or curative) for cholangiocarcinoma. For example, 3 patients with Bismuth type I hilar cholangiocarcinoma could not undergo surgical operation due to major vessel involvement of cholangiocarcinoma. And 6 patients with Bismuth type II hilar cholangiocarcinoma could not undergo surgical operation due to distant metastasis, major vessel involvement or previous hepatic lobectomy. In the cases without any treatment, the patient and his or her family elected to not pursue any aggressive palliation therapy including chemotherapy or radiotherapy after full explanation of risks and benefits of various treatment modalities. However, patients who received only non-surgical biliary drainage were included. We also excluded extrahepatic cholangiocarcinoma patients because most cases were candidates to surgical therapy. Univariate analysis was performed with the Kaplan-Meier method and log-rank test. Significant factors on univariate analysis were then evaluated by multivariate analysis using the Cox proportional hazards model. p values less than 0.05 were considered significant. Of the 1,377 cases reviewed, 330 patients with unresectable, advanced cholangiocarcinoma met our eligibility criteria: 203 intrahepatic and 127 hilar cholangiocarcinoma patients (Fig. 1). Median follow-up periods were 0.9 months (0.1-24 months) for intrahepatic cholangiocarcinoma patients and 2.7 months (0.1-24 months) for hilar cholangiocarcinoma patients. They consisted of 216 men (65.5%) and 114 women (34.5%) with a mean age of 59±10.5 years (mean±SD; range, 25 to 86). One hundred and thirty six (41.2%) patients had distant metastasis (Table 1). As a risk factor for the development of cholangiocarcinoma, 27 patients had Clonorchis sinensis infection, whereas only one patient had primary sclerosing cholangitis. Fifty-three patients had hepatolithiasis. Five patients had choledochal cyst and twenty eight patients had history of chronic viral hepatitis. Two hundred and three patients were diagnosed as intrahepatic cholangiocarcinoma: 132 men (65%) and 71 women (35%), with an age of 57±10.3 years (mean±SD; range, 29 to 82). Among them, 113 (55.7%) patients had distant metastasis. Stage distribution by TNM staging system was stage I in 1 (0.5%) patient, stage II in 1 (0.5%), stage III in 88 (43.3%) and stage IV in 113 (55.7%). By using the classification scheme for primary liver cancer proposed by the Liver Cancer Study Group of Japan,11,19,20 macroscopic growth patterns of patients with intrahepatic cholangiocarcinoma were classified as mass-forming type in 187 (92.1%) patients, periductal infiltrating type in 15 (7.4%) patients and intraductal type in 1 patient (0.5%), respectively (Table 1). One hundred and twenty seven patients were diagnosed as hilar cholangiocarcinoma: 84 men (66.1%) and 43 women (33.9%), with an age of 62±10.1 years (mean±SD; range, 25 to 86). The extent of intraductal spread by the Bismuth-Corlette classification system21 was Bismuth type I in 3 (2.4%) patients, Bismuth type II in 6 (4.7%), Bismuth type IIIA in 23 (18.1%), Bismuth type IIIB in 19 (15%), and Bismuth type IV in 76 (59.8%), respectively (Table 1). Median survival time of overall cholangiocarcinoma was 3.9±7.8 months (median±SD; range, 0.2 to 67.1); 3±5.3 months (0.2 to 37.7) for intrahepatic cholangiocarcinoma and 5.9±10.1 months (0.6 to 67.1) for hilar cholangiocarcinoma. By Kaplan-Meier survival analysis, intrahepatic cholangiocarcinoma patients had shorter survival than hilar cholangiocarcinoma (p<0.001) (Fig. 2). According to TNM staging in intrahepatic cholangiocarcinoma, median survival time of each stage revealed 6 months in stage I, 7.4 months in stage II, 4.4 months in stage IIIA, 3.6 months in stage IIIC and 2.5 months in stage IV, respectively. 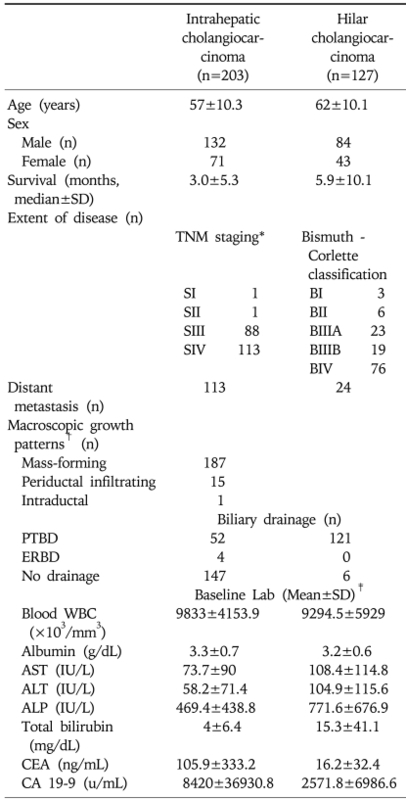 According to the Bismuth-Corlette classification system for hilar cholangiocarcinoma, median survival time of each stage identified 9.9 months in Bismuth type I, 2.6 months in Bismuth type II, 6 months in Bismuth type IIIA, 6 months in Bismuth type IIIB and 5.7 months in Bismuth type IV, respectively (Table 2). Univariate analysis showed that patients with baseline (before biliary decompression) serum albumin level >3.0 g/dL (p=0.005) and lower TNM staging (p=0.004) had significantly longer survival time, whereas patients with distant metastasis had significantly shorter survival time (p<0.001) (Tables 2 and 3). By multivariate analysis, distant metastasis was a poor prognostic factor predicting shorter survival (p<0.001; odds ratio [OR], 1.7; 95% confidence interval [CI], 1.3-2.3) and baseline serum albumin level>3.0 g/dL was an independent favorable prognostic factor (p<0.02; OR, 0.7; 95% CI; 0.5-0.9) (Table 3). By univariate analysis, patients with baseline serum albumin level>3.0 g/dL (p=0.02) had longer survival, whereas patients with baseline serum total bilirubin leve l>10.0 mg/dL (p=0.01), serum CEA level >30 ng/mL (p=0.008) had shorter survival. Disease extent by Bismuth-Corlette classification showed no correlation with survival (p=0.5) (Tables 2 and 4). Multivariate analysis showed serum CEA level>30 ng/mL (p=0.01; OR, 2.3; 95% CI, 1.2-4.5) was an independent predictor of shorter survival (Table 4). During the last few years, some emerging chemotherapeutic regimens and endoscopic interventions have been evaluated for the patients with advanced unresectable cholangiocarcinoma. In these studies, patients with advanced unresectable cholangiocarcinoma were reported to have a wide range of survival time from 57 days to 8.7 months.7,14,22-26 One recent trial14 reported that the endoscopic application of photodynamic therapy to malignant strictures prolonged median survival time of unresectable hilar cholangiocarcinoma when compared to those treated with nonsurgical biliary drainage alone. Compared to our study (median survival, 5.9 months), however, the nonsurgical biliary drainage alone group as a control displayed shorter survival (median survival, 98 days). One plausible explanation for different survival time between two studies may be differences in biliary drainage route used for relief of obstructive jaundice. While percutaneous biliary drainage (PTBD) was the sole approach for patients with hilar cholangiocarcinoma in our study, most patients received endoscopic retrograde biliary drainage (ERBD) in a previous study.14 In a recent study,26 PTBD showed significant higher rate of successful biliary decompression and lower level of procedure-related cholangitis in patients with advanced Bismuth type III or IV hilar cholangiocarcinoma, compared to ERBD. Compared to endoscopic drainage, PTBD may be more effective in achieving earlier recognition of drainage tube malfunction and preventing subsequent attacks of cholangitis and biliary sepsis, which may lead to longer survival. As for intrahepatic cholangiocarcinoma, Shaib et al.25 reported a median survival of 57 days in patients not receiving any palliative treatment, which was shorter than that (median 90 days) of our study. The authors addressed limitations of the analysis that only aged 65 years or older patients were included in the study and the information such as TNM staging was not recorded in 37.5% of enrolled patients due to the limitation of multi-institutional study.25 Differences in survival between two studies may stem from intrinsic factors including diverse ethnicity of patient population. Underlying disease may be another important contributing factor. While primary sclerosing cholangitis is often associated with cholangiocarcinoma in Western countries, it is relatively rarely seen in Asian countries.27 Actually, in our series of 330 patients of cholangiocarcinoma, we identified only one case of primary sclerosing cholangitis. Considering the fact that patients with primary sclerosing cholangitis are usually associated with chronic liver dysfunction and often progress to biliary cirrhosis,28 this difference may affect survival time. A few prognostic factors for survival were noted in our study. Serum albumin level above 3.0 g/dL was a favorable prognostic factor in both univariate and multivariate analysis for intrahepatic cholangiocarcinoma; whereas, it showed statistical significance only in univariate analysis for hilar cholangiocarcinoma. This factor has previously been attended by Nakeeb et al.9 who reported that preoperative serum albumin level was associated with longer survival in the surgical outcome of patients with cholangiocarcinoma. On the other hand, serum bilirubin level above 10 mg/dL have been reported to be associated with poor surgical outcome in patients with hilar cholangiocarcinoma on multivariate analysis;29,30 however, this factor was only a poor prognostic factor in univariate analysis of our patients with unresectable conditions (Table 4). Tumor markers disclosed some prognostic value in our series. For hilar cholangiocarcinoma, baseline serum CEA level above 30 ng/mL was an independent poor prognostic factor. However, CA 19-9 above 150 U/mL was poor prognostic factor in only univariate analysis (Table 4). Although some tumor markers have been investigated to diagnose cholangiocarcinoma31-35 and predict post-operative prognosis or recurrence,36-38 to our knowledge this is the first study to investigate the prognostic capability of tumor markers in cholangiocarcinoma patients without any surgery, chemotherapy or radiotherapy. In our study, multivariate analysis showed that distant metastasis was the only independently poor prognostic factor for intrahepatic cholangiocarcinoma (p<0.001), whereas TNM staging for intrahepatic cholangiocarcinoma showed significant relationship with survival time (p=0.004) only on univariate analysis. 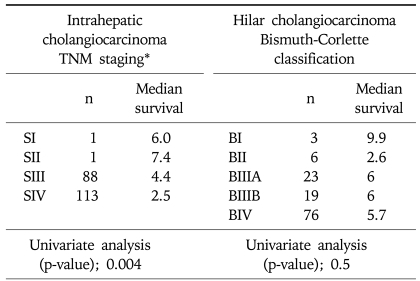 Interestingly, Bismuth-Corlette classification were not related to survival time of hilar cholangiocarcinoma (p=0.5). It may be because Bismuth-Corlette classification relies on intraductal tumor extension of cholangiocarcinoma, which cannot provide overall staging information. Several limitations of our study deserve comment. Our study was retrospective and, therefore, holds the usual limitation of such design. We could not follow up many cases to the time of death, so we investigated data of mortality offered by National Statistical Office for many cases. Unfortunately the data did not include a immediate cause of death, either. Therefore, we could not evaluate the immediate causes of death exactly. In addition, cut-off values of tumor markers were determined arbitrarily because it was not possible to calculate the Receiver Operating Characteristic (ROC) curve due to the death of all patients and the range of tumor markers from the previous studies35-38 was too wide to determine appropriate reference values. Despite these limitations, this is the largest study to date regarding this topic and all data were obtained from a single institute making data interpretation more reliable. Selection bias may also have been introduced into the results, as the review was confined to histologically proven cases. However, this was inevitable as some benign biliary disease including IgG4-associated cholangitis can mimic cholangiocarcinoma radiographically.39 In East Asia, recurrent pyogenic cholangitis associated with bile duct stones or liver fluke is not uncommon40,41 and in this setting, we cannot definitely rule out benign biliary disease on the basis of clinical findings without pathological confirmation. In conclusion, the median survival of unresectable cholangiocarcinoma was dismal. In terms of survival time, intrahepatic cholangiocarcinoma patients showed poorer prognosis than hilar cholangiocarcinoma patients. Distant metastasis and baseline serum albumin level were independent prognostic factors for intrahepatic cholangiocarcinoma, while serum CEA level for hilar cholangiocarcinoma. Fig. 1. Study population. Between 1996 and 2002, 1,377 patients were diagnosed with cholangiocarcinoma at our institute; 330 of these patients complied with the inclusion criteria and could thus be included in the study. *Although some cases were clinically operable, surgery was not performed due to the patients' refusal. Fig. 2. Survival graphs of advanced unresectable cholangiocarcinoma. The overall median survival time for all cholangiocarcinoma patients (n=330) was 3.9 months. The median survival time was shorter for those with intrahepatic cholangiocarcinoma (3 months) than for those with hilar cholangiocarcinoma (5.9 months; p<0.001). PTBD, percutaneous transhepatic biliary drainage; ERBD, endoscopic retrograde biliary drainage. *AJCC 6th edition; †The classification proposed by the Liver Cancer Study Group of Japan20; ‡Checked before biliary drainage. *Median survival according to TNM stage is described in Table 2; †Mass-forming growth pattern according to the classification proposed by the Liver Cancer Study Group of Japan20; ‡WBC>10,000 (×103/mm3). *Median survival according to Bismuth-Corlette classification is described in Table 2; †WBC>10,000 (×103/mm3). de Groen, PC, Gores, GJ, LaRusso, NF, Gunderson, LL, Nagorney, DM. Biliary tract cancers. N Engl J Med, 1999;341;1368-1378. Lazaridis, KN, Gores, GJ. Cholangiocarcinoma. Gastroenterology, 2005;128;1655-1667. Nair, S, Shiv Kumar, K, Thuluvath, PJ. Mortality from hepatocellular and biliary cancers: changing epidemiological trends. Am J Gastroenterol, 2002;97;167-171. Patel, T. Increasing incidence and mortality of primary intrahepatic cholangiocarcinoma in the United States. Hepatology, 2001;33;1353-1357. Olnes, MJ, Erlich, R. A review and update on cholangiocarcinoma. Oncology, 2004;66;167-179. Witzigmann, H, Berr, F, Ringel, U, et al. Surgical and palliative management and outcome in 184 patients with hilar cholangiocarcinoma: palliative photodynamic therapy plus stenting is comparable to r1/r2 resection. Ann Surg, 2006;244;230-239. Sasaki, A, Aramaki, M, Kawano, K, et al. Intrahepatic peripheral cholangiocarcinoma: mode of spread and choice of surgical treatment. Br J Surg, 1998;85;1206-1209. Washburn, WK, Lewis, WD, Jenkins, RL. Aggressive surgical resection for cholangiocarcinoma. Arch Surg, 1995;130;270-276. Patel, T, Singh, P. Cholangiocarcinoma: emerging approaches to a challenging cancer. Curr Opin Gastroenterol, 2007;23;317-323. Reddy, SB, Patel, T. Current approaches to the diagnosis and treatment of cholangiocarcinoma. Curr Gastroenterol Rep, 2006;8;30-37. Mansfield, SD, Barakat, O, Charnley, RM, et al. Management of hilar cholangiocarcinoma in the North of England: pathology, treatment, and outcome. World J Gastroenterol, 2005;11;7625-7630. Ortner, ME, Caca, K, Berr, F, et al. Successful photodynamic therapy for nonresectable cholangiocarcinoma: a randomized prospective study. Gastroenterology, 2003;125;1355-1363. Lee, HY, Kim, SH, Lee, JM, et al. Preoperative assessment of resectability of hepatic hilar cholangiocarcinoma: combined CT and cholangiography with revised criteria. Radiology, 2006;239;113-121. Weber, SM, DeMatteo, RP, Fong, Y, Blumgart, LH, Jarnagin, WR. Staging laparoscopy in patients with extrahepatic biliary carcinoma: analysis of 100 patients. Ann Surg, 2002;235;392-399. Burke, EC, Jarnagin, WR, Hochwald, SN, Pisters, PW, Fong, Y, Blumgart, LH. Hilar cholangiocarcinoma: patterns of spread, the importance of hepatic resection for curative operation, and a presurgical clinical staging system. Ann Surg, 1998;228;385-394. D'Angelica, MI, Jarnagin, WR, Blumgart, LH. Resectable hilar cholangiocarcinoma: surgical treatment and long-term outcome. Surg Today, 2004;34;885-890. Isaji, S, Kawarada, Y, Taoka, H, Tabata, M, Suzuki, H, Yokoi, H. Clinicopathological features and outcome of hepatic resection for intrahepatic cholangiocarcinoma in Japan. J Hepatobiliary Pancreat Surg, 1999;6;108-116. Sano, T, Kamiya, J, Nagino, M, et al. Macroscopic classification and preoperative diagnosis of intrahepatic cholangiocarcinoma in Japan. J Hepatobiliary Pancreat Surg, 1999;6;101-107. Bismuth, H, Castaing, D, Traynor, O. Resection or palliation: priority of surgery in the treatment of hilar cancer. World J Surg, 1988;12;39-47. Smith, AC, Dowsett, JF, Russell, RC, Hatfield, AR, Cotton, PB. Randomised trial of endoscopic stenting versus surgical bypass in malignant low bileduct obstruction. Lancet, 1994;344;1655-1660. Miyakawa, S, Ishihara, S, Takada, T, et al. Results from the Biliary Tract Cancer Statistics Registry in Japan based on general rules for surgical and pathological studies on cancer of the biliary tract: hilar cholangiocarcinoma. Kan Tan Sui, 2005;50;415-424. Connor, S, Barron, E, Redhead, DN, et al. Palliation for suspected unresectable hilar cholangiocarcinoma. Eur J Surg Oncol, 2007;33;341-345. Shaib, YH, Davila, JA, Henderson, L, McGlynn, KA, El-Serag, HB. Endoscopic and surgical therapy for intrahepatic cholangiocarcinoma in the united states: a population-based study. J Clin Gastroenterol, 2007;41;911-917. Paik, WH, Park, YS, Hwang, JH, et al. Palliative treatment with self-expandable metallic stents in patients with advanced type III or IV hilar cholangiocarcinoma: a percutaneous versus endoscopic approach. Gastrointest Endosc, 2009;69;55-62. Broome, U, Olsson, R, Loof, L, et al. Natural history and prognostic factors in 305 Swedish patients with primary sclerosing cholangitis. Gut, 1996;38;610-615. Kaplan, GG, Laupland, KB, Butzner, D, Urbanski, SJ, Lee, SS. The burden of large and small duct primary sclerosing cholangitis in adults and children: a population-based analysis. Am J Gastroenterol, 2007;102;1042-1049. Weber, A, Landrock, S, Schneider, J, et al. Long-term outcome and prognostic factors of patients with hilar cholangiocarcinoma. World J Gastroenterol, 2007;13;1422-1426. Su, CH, Tsay, SH, Wu, CC, et al. Factors influencing postoperative morbidity, mortality, and survival after resection for hilar cholangiocarcinoma. Ann Surg, 1996;223;384-394. Su, WC, Chan, KK, Lin, XZ, et al. A clinical study of 130 patients with biliary tract cancers and periampullary tumors. Oncology, 1996;53;488-493. Kuusela, P, Haglund, C, Roberts, PJ. Comparison of a new tumour marker CA 242 with CA 19-9, CA 50 and carcinoembryonic antigen (CEA) in digestive tract diseases. Br J Cancer, 1991;63;636-640. Gores, GJ. Early detection and treatment of cholangiocarcinoma. Liver Transpl, 2000;6;S30-S34. Charatcharoenwitthaya, P, Enders, FB, Halling, KC, Lindor, KD. Utility of serum tumor markers, imaging, and biliary cytology for detecting cholangiocarcinoma in primary sclerosing cholangitis. Hepatology, 2008;48;1106-1117. Kim, HJ, Kim, MH, Myung, SJ, et al. A new strategy for the application of CA19-9 in the differentiation of pancreaticobiliary cancer: analysis using a receiver operating characteristic curve. Am J Gastroenterol, 1999;94;1941-1946. Miwa, S, Miyagawa, S, Kobayashi, A, et al. Predictive factors for intrahepatic cholangiocarcinoma recurrence in the liver following surgery. J Gastroenterol, 2006;41;893-900. Heimbach, JK, Gores, GJ, Haddock, MG, et al. Predictors of disease recurrence following neoadjuvant chemoradiotherapy and liver transplantation for unresectable perihilar cholangiocarcinoma. Transplantation, 2006;82;1703-1707. Ohtsuka, M, Ito, H, Kimura, F, et al. Results of surgical treatment for intrahepatic cholangiocarcinoma and clinicopathological factors influencing survival. Br J Surg, 2002;89;1525-1531. Ghazale, A, Chari, ST, Zhang, L, et al. Immunoglobulin G4-associated cholangitis: clinical profile and response to therapy. Gastroenterology, 2008;134;706-715. Kim, MH, Sekijima, J, Lee, SP. Primary intrahepatic stones. Am J Gastroenterol, 1995;90;540-548. Cha, JM, Kim, MH, Lee, SK, et al. Clinicopathological review of 61 patients with early bile duct cancer. Clin Oncol (R Coll Radiol), 2006;18;669-677.